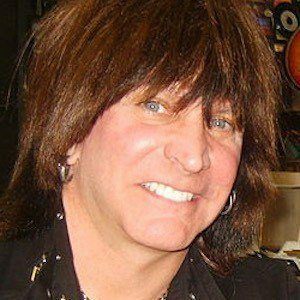 Renowned guitarist who rose to fame as a member of the metal band Nitro in the 1980s. He gained notoriety for his showmanship, wielding double and quad guitars, playing sweeping arpeggios, and using his trademark "over-under" playing technique. He was named by Guitar One Magazine as the No. 1 Shredder of All Time in 2003. At only five years old he began playing piano and composing music. By ten he was playing guitar and by twelve he was playing for bands, clubs, and choirs on the weekends. At thirteen his guitar instructor told him he could teach him no more and he began teaching himself by watching professionals. In 1993, he created the M.A.C.E. music label and it became one of the first online labels to arise in 1996. He was born and raised in Chicago, Illinois to an Italian father and a German mother. He has given guitar lessons to artists like Rage Against the Machine's Tom Morello and Creed's Mark Tremonti.